An exciting and unusual IPO opportunity from an innovative company came and went last week. Judging from the apparent overwhelming demand for the Fundrise “iPO” (Internet Public Offering), it may inspire future similar IPO opportunities in fast-growing companies through Regulation A+, the same law that enabled the ShiftPixy and HomeUnion IPO attempts. Unfortunately, we missed this one. But perhaps it’s a sign of where the IPO and crowdfunding markets are headed. Fundrise is a Washington D.C.-based real estate crowdfunding company, recognized as a Forbes 50 Fintech standout. Fundrise finds and vets compelling real estate deals, then makes investments in them with money raised through its investor base. Investors buy shares in the various Fundrise eREITs, then the company uses the proceeds to partner with regional developers and property managers. REITs, or, real estate investment trusts, are common equity holdings known for their low-tax structure and healthy dividends. They trade on exchanges like normal stocks. The eREIT, on the other hand, is an innovative product created by Fundrise to empower ordinary investors to invest in commercial real estate deals from the comfort of their home office or smartphone. eREITs don’t trade on open markets. They’re only available to investors with a Fundrise account. Fees are up to 90% lower than a traditional REIT fees. Fundrise was an early innovator in real estate crowdfunding. What sets this company apart from other real estate crowdfunding sites, is the eREITs are registered securities with the SEC. This distinction allows non-accredited investors to invest as little as $1,000 in an eREIT. Most other real estate crowdfunding sites require the investor to be accredited. I recently opened an account and bought my first eREIT. The investment is expected to provide quarterly dividend income for the next 4-6 years. Any capitals gains will be paid out toward the end of the investment time horizon. Read this comprehensive Fundrise review to learn more about the platform. As of February 2017, the company has created five eREITs. Two are sold out and three are currently taking on new investors. At last count, they have 123,000 members and sponsored about $210 million in debt and equity investments. But I didn’t buy soon enough. In late-January, I came across a 1-A filing on the SEC website while scanning the SEC Feed on Access IPOs. The filing was for Rise Companies Corp., the parent of Fundrise. I knew of Fundrise because it’s a D.C.-based crowdfunding startup in the same space as RealtyShares (read a RealtyShares review here) and PeerStreet (read a PeerStreet review here), all of which I’m an investor on their platforms. All three are leaders in the real estate crowdfunding space, taking advantage of the 2012 JOBS act. Real estate crowdfunding is a way for income investors to add risk and higher yields to build diverse passive income streams through real property ownership and lending to developers. The Fundrise iPO is not a traditional IPO. The company is only offering shares to its customers currently invested in one or more of its eREITs. What makes this so innovative is the company is essentially crowdfunding itself. They’re calling it the first of its kind. In the days leading up to the IPO reservation period, the Co-Founder and CEO of Fundrise, Ben Miller, teased investors about new innovation on the home page. A few days later, reservations for the Fundrise iPO became available to existing Fundrise eREIT investors. We believe that having our customers become “investor-owners” of the Company will increase our brand equity, transforming our customers into champions of our business, and energizing our model in a way that will drive significant value to us, and therefore our investor-owners. This explanation is similar to what we often hear from Loyal3. Offering shares of the company to existing customers increases engagement and brand loyalty, turning customers into ambassadors. Sniffing this opportunity out a few days before it was live, I contemplated alerting Access IPOs subscribers. However, since this wasn’t a traditional IPO and was more of a crowdfunding opportunity, I decided against it. On top of that, investing required multiple steps. First, you needed to open a Fundrise account and start investing in eREITs. If completed in time, then you’d have the opportunity to invest in the Fundrise iPO. There’s also no immediate exit. These shares won’t trade on the open markets, so the money is illiquid, at least for now. Most IPO investors are looking for a quick buck. Before I learned about the Fundrise iPO opportunity, I had already opened an account because I was planning to invest in an eREIT to diversify income streams. But I wasn’t in a hurry, so I didn’t complete my due diligence and invest until a few days ago. I never received an email alert on the IPO opportunity, and thus, didn’t find out until it was too late. As I write this, reservations have been paused. The demand for IPO shares was very high. As of 02/05/2017, 8,327 customers expressed interest in the Fundrise iPO. The dollar amount of interest was a whopping $93,000,000! The SEC Form 1-A disclosed that the offering was for just 2,000,000 shares at $5/share, and a $1,000 minimum investment per investor. The original maximum offering was $10,000,000. UPDATE: An amended SEC 1-A filing late Friday bumped the offering up to 3,000,000 at $5/share for a total of $15,000,000. Clearly, nine-fold demand was higher than expected. That’s likely why they paused the investment window. The company will have to sort out how to allocate shares, and perhaps decide to issue more shares. Unless they do, it looks like new investors will be unable to participate. I did reach out to customer service and they left open the possibility more shares would be offered, but certainly made no guarantee. I’m disappointed I probably won’t be able to participate in this exciting IPO. It’s a lesson in being nimble. I should have invested once I learned of the opportunity. I briefly mentioned this opportunity in the big cheese article but there wasn’t enough time for readers to participate. The purpose of bringing this event to your attention is that the future of IPOs is rapidly changing. We’ve already seen two Reg A + IPOs listed on Motif Investing. One is indefinitely postponed and the other appears to be withdrawn. But they tried! Many readers are frustrated that these Reg A+ IPOs failed. Remember, this is new territory. Companies and their underwriters need to figure out how to price and administer these within the constraints of a highly regulated industry. Now that we’ve seen this innovative self-administered IPO in the works, more companies could choose to do something similar. For all we know, Fundrise might be experimenting with its own IPO today with future plans to provide Reg A+ IPO assistence services to other growing companies looking to raise money. With demand for this IPO through the roof, other companies will take note. 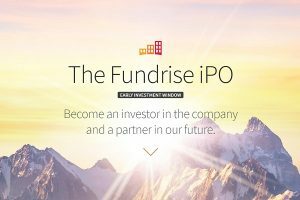 If you’re interested in reading more about the Fundrise iPO, check out this article on Crowdfund Insider. Disclosure: I own shares of the East Coast eREIT. I’m also an affiliate partner of Fundrise. If you use any links in this article to open an account with Fundrise, I may receive a commission at no cost to you. This article is not a recommendation to buy or sell real estate or eREITs. The information contained herein neither constitutes an offer for nor a solicitation of interest in any securities offering; however, if an indication of interest is provided, it may be withdrawn or revoked, without obligation or commitment of any kind prior to being accepted following the qualification or effectiveness of the applicable offering document, and any offer, solicitation or sale of any securities will be made only by means of an offering circular, private placement memorandum, or prospectus. No money or other consideration is hereby being solicited, and will not be accepted without such potential investor having been provided the applicable offering document. Joining the Fundrise iPO Platform neither constitutes an indication of interest in any offering nor involves any obligation or commitment of any kind. The publicly filed offering circulars of the issuers sponsored by Rise Companies Corp., not all of which may be currently qualified by the Securities and Exchange Commission, may be found at www.fundrise.com/oc. Again it’s possibly that they will only iPo in 2-5 years or not ever it’s more of an angel investment then an iPo investment. Good points. With any early investments, you’re taking on considerable risk. Both equity and real estate crowdfunding are in the early stages. In the coming years, some investors will win big while others will lose their shirts. This opportunity was not limited to accredited investors. Individuals need to read the SEC documents and decide for themselves whether they can risk the money or not.